Kamei T, Kumano H and Masumura S: (1997). Changes of immunoregulatory cells associated with psychological stress and humor. Percept Mot Skills 84: 1296-1298. Berk, LS, Tan, SA, Bittman, BB & Westengaard J (2001) Modulation of neuroimmune parameters during the eustress of humor-associated mirthful laughter. Altern. Ther Health Med, 7,62 -76. Bennet, MP, Zeller, JM, Rosenberq L & McCann, J. (2003). The effect of mirthfull laughter on stress and natural killer cell activity. Altern. Ther Health Med, 9, 38 ? 45. Toda M, Kusakabe S, Nagasawa S, Kitamura K, Morimoto K. (2007). Effect of laughter on salivary endocrinological stress marker chromogranin A. Biomed Res. 2007 Apr;28(2):115-8. Mario et al. (2010). Stress-moderating effects of positive emotions:exposure to humorous movies during hemodialytic sessions decreases blood levels of stress hormones. Journal of Chinese Clinical Medicine, 5(2):61-70. Kimata H. (2001) Effect of humor on allergen-induced wheal reactions. JAMA. Feb 14;285(6):738. Kimata H. (2004). Differential effects of laughter on allergen-specific immunoglobulin and neurotrophin levels in tears. Percept Mot Skills. 2004 Jun;98(3 Pt 1):901-8. Kimata H. (2004). Effect of viewing a humorous vs. nonhumorous film on bronchial responsiveness in patients with bronchial asthma. Physiol Behav. 2004 Jun;81(4):681-4. Kimata H. (2004). Elevation of breast milk leptin levels by laughter. Horm Metab Res. 2004 Apr;36(4):254-6. Kimata H.(2004). Reduction of allergic responses in atopic infants by mother's laughter. Eur J Clin Invest. 2004 Sep;34(9):645-6. Kimata H. (2004). Laughter counteracts enhancement of plasma neurotrophin levels and allergic skin wheal responses by mobile phone-mediated stress. Behav Med. 2004 Winter;29(4):149-52. Kimata H. (2006). Emotion with tears decreases allergic responses to latex in atopic eczema patients with latex allergy. J Psychosom Res. 2006 Jul;61(1):67-9. Kimata H. (2007). Viewing humorous film improves nighttime wakening in children with atopic dermatitis. Indian Pediatr. 2007 Apr;44(4):281-5. Kimata H. (2007). Increase in dermcidin-derived peptides in sweat of patients with atopic eczema caused by a humorous video. J Psychosom Res. 2007 Jan;62(1):57-9. Kimata H. Viewing a humorous film decreases IgE production by seminal B cells from patients with atopic eczema. J Psychosom Res. 2009 Feb;66(2):173-5. Epub 2008 Nov 22. Kimata H. Elevation of testosterone and reduction of transepidermal water loss by viewing a humorous film in elderly patients with atopic dermatitis. Acta Medica (Hradec Kralove). 2007;50(2):135-7. Hayashi T, Urayama O, Kawai K, et al. Laughter regulates gene expression in patients with type 2 diabetes. Psychother Psychosom. 2006;75(1):62-65. Hayashi T, Tsujii S, Iburi T, et al. Laughter up-regulates the genes related to NK cell activity in diabetes. Biomed Res. 2007;28(6):281-285. Hayashi T, Murakami K. The effects of laughter on post-prandial glucose levels and gene expression in type 2 diabetic patients. Life Sci. 2009;85(5-6):185-187. Hayashi K., RN, Hayashi T., Iwanaga S., Kawai K., Ishii H., Shoji S., & Murakami K. (2003). Laughter regulates gene expression in patients with type 2 diabetes.Diabetes Care, 2685), 1651 -2. Fry, W. (1979). Mirth and the human cardiovascular system. In H. Mindess & J. Turek (Eds. ), The study of humor (pp. 56?61). Antioch University Press. Boone T., Hansen S. & Erlandson A. (2000). Cardiovascular responses to laughter: A pilot project. Applied Nursing Research, Volume 13, Issue 4, 204-208. Tan SA, Tan LG, Berk LS et al. 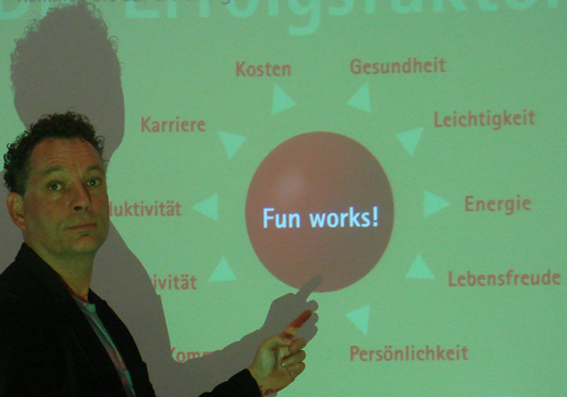 Mirthful laughter an effective adjunct in cardiac rehabilitation. Can J cardiol.1997;13 (suppl B):190. Michael Miller, M.D. (2000). "Laughter is good for your heart". The results of the study, conducted at the Center for Preventive Cardiology, Maryland Medical Center USA, were presented at the American Heart Association?s 73rd Scientific Sessions on November 15 in New Orleans. Clark A , Seider A, Miller M. (2001). Inverse association between sense of humor and coronary artery disease. International Journal of Cardiology. 80(1)87-8. Sakuragi S, Sugiyama Y, Takeuchi K.(2002).Effects of laughing and weeping on mood and heart rate variability. J Physiol Anthropol Appl Human Sci.;21(3):159-65. Michael Miller, M.D. (2005). "Laughter helps blood vessels function better". The results of the study, conducted at the University of Maryland Medical Center, were presented at the Scientific Session of the American College of Cardiology on March 7, 2005, in Orlando, Florida. Sahakian A, Frishman WH. (2007). Humor and the cardiovascular system. Altern Ther Health Med.;13(4):56-8. Vlachopoulos C, Xaplanteris P, Alexopoulos N, Aznaouridis K, Vasiliadou C, Baou K, Stefanadi E, Stefanadis C. (2009). Divergent effects of laughter and mental stress on arterial stiffness and central hemodynamics. Psychosom Med.;71(4):446-53. McMullen Leise, C. (1993). The correlation between humor and the chronic pain of arthritis. Journal of Holistic Nursing 11, 82?95. Yoshino S, Fujimori J, Kohda M. (1996). Effects of mirthful laughter on neuroendocrine and immune systems in patients with rheumatoid arthritis. J Rheumatol.;23(4):793-4. Nakajima A, Hirai H, Yoshino S.(1999). Reassessment of mirthful laughter in rheumatoid arthritis. J Rheumatol.;26(2):512-3. Matsuzaki T, Nakajima A, Ishigami S, Tanno M, Yoshino S. (2006). Mirthful laughter differentially affects serum pro- and anti-inflammatory cytokine levels depending on the level of disease activity in patients with rheumatoid arthritis. Rheumatology (Oxford);45(2):182-6. Nevo, Ofra, Giora Keinan, & Mina Teshimovsky-Arditi. (1993) "Humor and Pain Tolerance." HUMOR: International Journal of Humor Research 6.1: 71-88. Weisenberg M, Tepper I, Schwarzwald J. (1995). Humor as a cognitive technique for increasing pain tolerance. Pain; 63:207?12. Weisenberg M, Raz T, Hener T. (1998).The influence of film-induced mood on pain perception. Pain, 76(3):365-75. Stuber M, Hilber SD, Mintzer LL, Castaneda M, Glover D, Zeltzer L. (2009). Laughter, humor and pain perception in children: a pilot study. Evid Based Complement Alternat Med.;6(2):271-6. 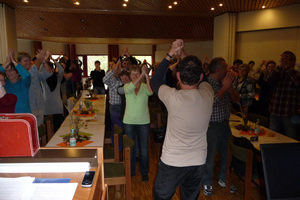 Willkommen beim Europäischer Berufsverband für Lachyoga und Humortraining e.V. Hat man sich erst einmal bewußt gemacht, wie umfassend positiv das Erfolgsprinzip auf unser Glück, Gesundheit und Erfolg wirkt, ist es auch einfacher einzusteigen.